Threema Apk is a famous android application which is widely used for securing your messages and data from hackers, cooperation, and Government hands. 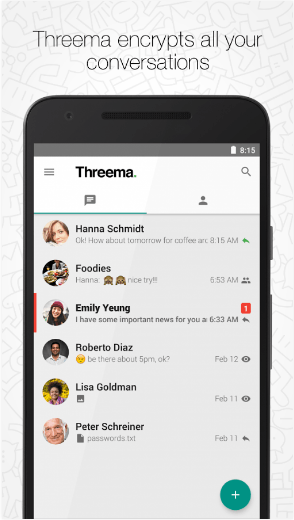 threema includes many features which can make you chatting and talk better. It has the highest ENCRYPTION STRENGTH which means that your data and messages are highly secure from any kind of hackers attack. 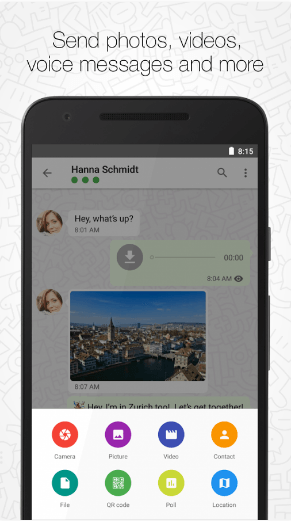 Threema can be used for send messages, images, videos, documents (pdf, zip, gif etc) to your trusted contacts and your groups. It includes a unique feature of creating poll which can use for conducting polls in group chat. Other features are quick reply with agree or disagree option, dark and light theme, verifying contact identity and many more, which have been discussed below. 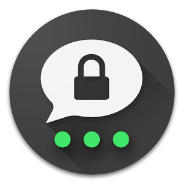 Secure your text and voice messages. Share, video, images, location with highest encryption strength. Send and receive documents (pdfs, gifs, zips etc). You can also use threema from your desktop through Threema Web. Get an option for different themes. Synchronize your contacts with one click. Verify contacts identity by scanning their personal QR code. 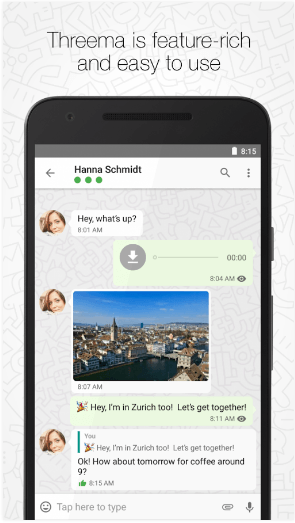 Threema end to end encrypts all your communication including chat, voice messages, groups, groups and even status messages too. Only the recipient person has access to your chat. Threema uses the trusted open source NaCl cryptography library for encryption. The encryption keys are generated and safely stored on user’s devices to prevent backdoor access or copies. Threema Apk confirms contacts with QR scan or key fingerprint to prevent man in middle attack. Read your contacts / modify your contacts: used for address book synchronization. When the synchronization is turned off, your contact data is not read or modified. Precise location (GPS and network-based): used for “send location” feature. Add or remove accounts, find accounts, create accounts: required for contact synchronization and integration in Android’s account management. Modify or delete the contents of your USB storage: required for storing media files (images, videos, audio). Threema’s functionality can be further extended by separately downloadable plugins which may require additional permissions (e.g. access to camera, microphone).